I did buy myself some '9-5' cleanser from Lush though, that was my big splurge of the day...£4.95! I'd really recommend it, particularly if you have sensitive skin, it's great for taking your makeup off, I find it much gentler than wipes. You can buy yours here! Now I'm not really a drinker at all, but I do like the odd cocktail, so after tirelessly browsing the shops, we went to Indigo in The Gate and finished off with a nice drink. 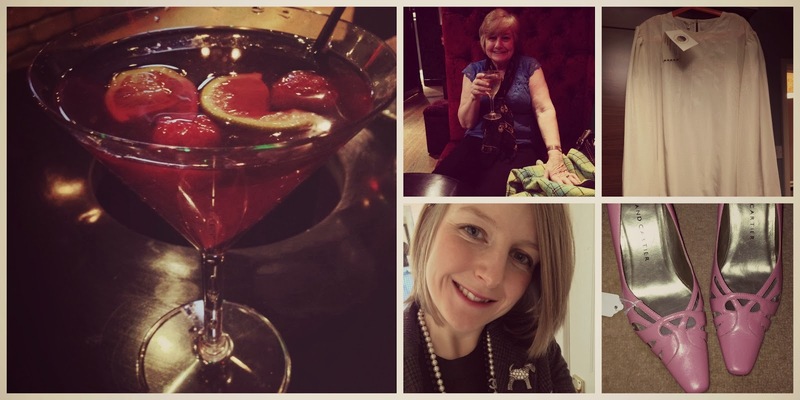 Mama L loves a white wine, mine was of course a Cosmo (see collage)...which by the way they now sell by the bottle in Tesco's!!! What a treat my Mister and I had on Saturday night when we found that out...and it's actually very, very nice! Finally, the two little pics on the end of my collage are my latest purchases from Scout, my lovely friend Angela's shop which you can read about here! I'm being so careful with my spending to save up for my Paris trip, but I couldn't resist this lovely white floaty blouse and those gorgeous pink Roland Cartier shoes. In fact I think they'll be coming to Paris with me! And the best part? Under £20 for both purchases...£14.95 for the shoes and £4.45 for the top...sometimes you've got to love a little bit of vintage! I'm going to a Vintage fair Saturday, and then a charity ball next week with my VBF and our lovely boyfriends, so if you don't hear from me before, will have lots to tell you about then! Enjoy your weekend my lovelies! PS-what have you been up to lately...I'd love to hear all about it!